The N3 has always been a strange test. It is halfway between N4 and N2 and while the N2 and N4 had old tests that you could practice with to get an idea of what level those tests are, N3 does not. It is a new level of the test created in 2010 to help students bridge the gap between the N4 and N2. This gap is pretty big too. The difference between N4 and N2, in my opinion, is that N2 and above really test your language skills. At the higher levels, you can’t just study a lot of vocabulary, kanji, and grammar and expect to pass easily. You need to really practice reading and listening for comprehension. N3 does a decent job of helping you step up to this next level. Although, you will have to change a lot about how you study in order to really make the jump. Take it, I dare you. The JEES released practice workbooks for you to practice with before you go and take the real thing. These can help you get a good idea of the level of the test, especially since a lot of people don’t really know the level (even textbook makers). But, the practice workbooks are made up of previous test questions, so they should, in theory, be the same level as the test. The one downside is that these workbooks don’t offer any explanations of the answers or any test strategies. So, if you need a little more help, you might want to pick up a practice test as well. This is especially true if you are a self-learner and don’t have a tutor to go over these questions with. I think one of the best things about taking a test is that you can discover and learn from your mistakes. If you don’t have time to go through this entire workbook, I still have the older, but shorter JLPT N3 Practice Test available that you can use as well. If you are taking the N4, I also have the JLPT N4 Practice Workbook available, as well as the JLPT N5 Practice Workbook for those taking the N5, too. Again, I separated out the 4 large audio files into separate CD tracks for each question, so that it is a lot easier to review. I even included the muzak break! 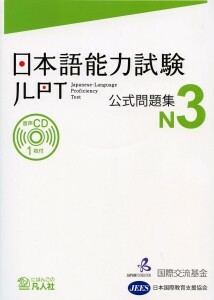 If you are pressed for time, the much shorter older JLPT N3 Practice Test is also still available. Also, if you prefer a hard copy, so that you can doodle on it and take notes, you can pick up the printed copy of the Official JLPT N3 Workbook here. What you are Standing Around here for? Go forth and take this practice test, practice workbook thingy. Download it and give it a whirl, you really don’t have anything to lose. Let me know how you did in the comments. Thank you very much! :)) N2 practice test is not available? They’ve hidden it pretty well, but it is there. Unfortunately, I might not be able to make notes on the N2 and N1 versions due to some copyright restrictions. np, I’m glad they make these things available. They are a big help. Hi there, thank you for this! I have just stumbled upon your site while checking out info for JLPT N3 as I have just returned to uni study using Integrated Approach to Intermediate Japanese. While I think now, my level isn’t there it’s good to use the resources here to help assist me passing. Thanks a lot! I’ll try to keep the good stuff coming. Definitely loving this site. I really appreciate the materials you’re providing and interesting blog entries. Do you have any preferred textbook recommendations? N3 is such a weird test, textbook makers are still a little unsure what is covered at that level. It really depends on your weaknesses, but I recommend the Kanzen Master series for N3+. The grammar, reading, and listening books are worth every penny (I would almost pay double for them to be honest). The So-Matome series are an easy guide and aren’t as brutal as the Kanzen Master series though. They have more English and clearer, step by step exercises, but are, in general, easier than the test. Vocabulary and Kanji can easily be picked up from Anki/SRS work and just doing some good old fashion reading, which at the N3 level, it is time to start looking into some native books. Thank you very much for your goods. It’s very useful for myself at this time when the text nearly coming. No problem, good luck on the test! Sorry for this late reply, but I just got done double checking the file. It seems to be okay on the server so maybe something got messed up when you downloaded it? No problem. I hope you did well in the test! No problems, hope it helps. THANKS A BILLION! You know it isn’t easy acquiring copies of good jlpt practice materials if it isn’t for living in Japan yourself. I’ll make sure I make the most out of this. Thanks again! No problems, I hope I can help you out. Thanks alot for the materials , will be using it these 3 months earnestly to pass the december test ! For N3, I think it is really important to do a lot of reading to prep yourself, and get used to reading at a good speed.